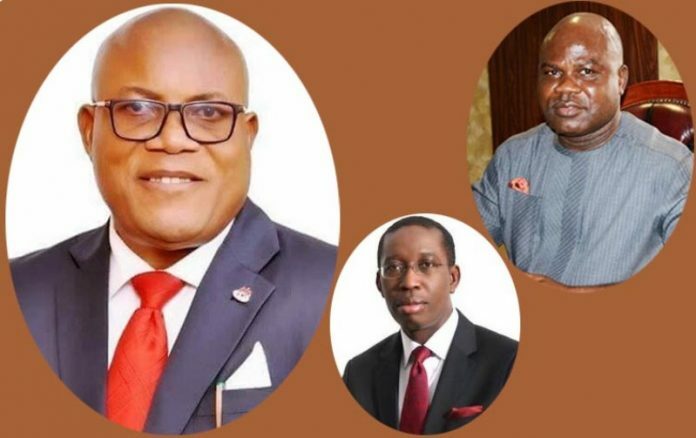 The likelihood of most favored candidate for the next Secretary to the State Government (SSG), George Orogun may be shattered if the odds against him sail through. SecretReporters can report without challenge that the position of the SSG will be zoned to Ethiope East and the very knowledgeable administrator and economist, Orogun has been picked as the favorite by the Governor, Mr Ifeanyi Okowa, who sees in him the man to drive his ‘Stronger Delta’ mantra. Orogun narrowly missed becoming the SSG in 2015 to Mr Festus Agas. According to government insiders and powerful sources, the campaign Director General for the just concluded election, Solomon Funkekeme, has made it clear to those close to him that Okowa must appoint him as the next SSG as the political tradition of the Peoples Democratic Party (PDP) demands or he will rock the boat. It’s not clear to this medium what he means by rocking the boat. We gathered that the Dollar Man as Funkekeme is fondly called, due to his antecedent of taking only dollars as kickbacks from contractors when he held sway as the Commissioner for Works under former Governor Emmanuel Uduaghan noted that Okowa was appointed as SSG to Uduaghan when he pioneered the former number one to victory. Okowa continued the tradition by appointing Agas who was his DG as the SSG. This precedent is what the dollar man is banking on. SecretReporters can also confirm that another person eying the position of the SSG is Mr Evance Iwurie who currently represents Ethiope East in the State House of Assembly, but won’t return as he was beaten by the candidate of the All Progressive Congress. While working behind the scene, he’s also lobbying to be made the Commissioner for Works against Arthur Akpowowo who has been penciled down for the post but not the works portfolio.